Is anything worth the terror of ... 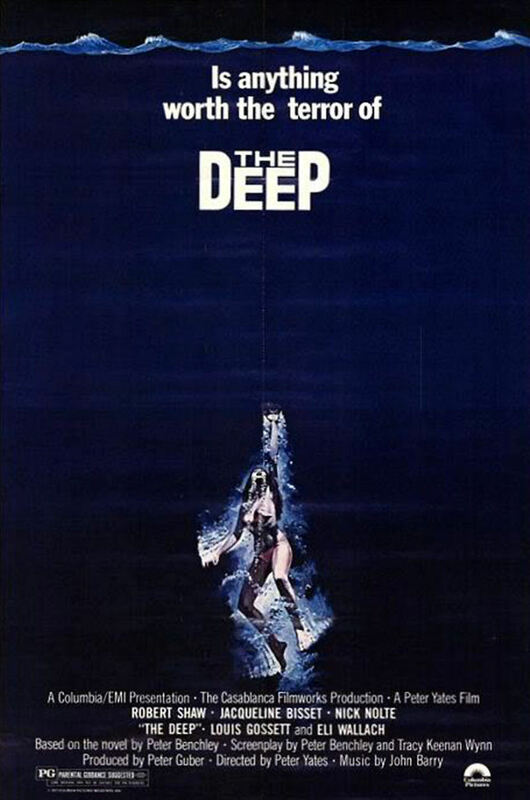 The Deep. When a couple go on a scuba diving excursion off the Bermuda coast, they find a variety of treasures, including a container of mysterious liquid and an antique medallion with a woman's likeness on it. With the help of a local, the items are identified as Spanish in origin. Eventually, a drug lord takes notices and begins to terrorize them with Haitian black magic when they refuse to sell the liquid to them. The liquid turns out to be medical morphine from a WWII shipwreck, exposed during a storm that may have also opened up a much older Spanish shipwreck filled with treasure. The couple begins to research the history of the Spanish shipwreck and realize how valuable the ship's contents actually are and conflict ensues as the treasure hunters battle the the drug dealer and his henchman.